Those living in New Hampshire are blessed with an abundance of natural wonders—the ocean, mountains and countless lakes and streams. Several state parks in the Granite State feature these wonders, affording visitors the opportunity to experience them firsthand. Check out the following New Hampshire state parks. You’ll be glad you did. Swimming, boating, playing in the sun and surf and more await visitors at Hampton Beach State Park. The park has been a popular tourist spot for many decades. There are bathhouses, lifeguards during the daytime hours, a boardwalk adjacent to the state park, and live entertainment on many summer evenings. 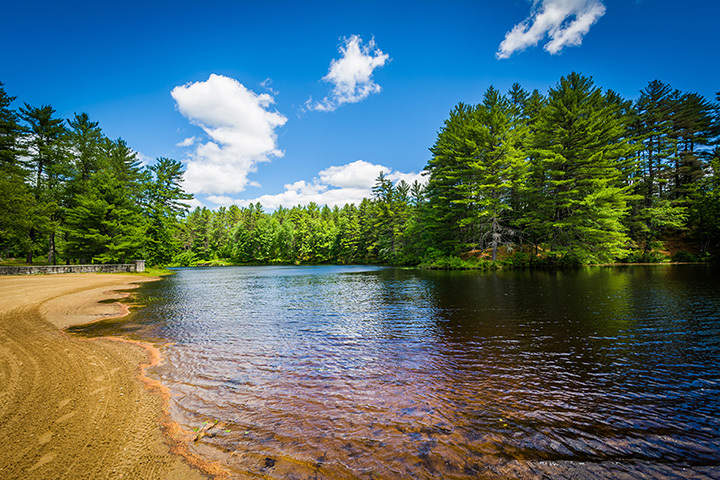 Featuring close to 200 campsites for visitors, Pawtuckaway State Park is also a favorite day trip destination for New Hampshire residents and guests. The beautiful sand beach is perfect for swimming, lounging and more, and the calm waters encourage kayakers to put their vessels in the water. Rentals are available. There are lots of hiking trails as well. With its stunning view of the Atlantic Ocean and its on site Seacoast Science Center, there’s something for everyone at Odiorne State Park. Bring your bicycle and ride (or walk) the extensive network of trails that wind through the woods and past the rocky shoreline. Entering the water at Odiorne isn’t advised. Located on Kezar Lake, Wadleigh State Park lures swimmers each year as the weather turns warm. Bring a picnic and spend the day. A bathhouse and playing fields make it perfect for a family outing. Saltwater fishing is the activity of choice at Rye Harbor State Park. Views of the Atlantic Ocean are brilliant, and picnic tables allow for relaxation when not casting a line. The breeze at this spot is always comforting, especially on the warmest summer days. Rest rooms are available. Featuring a clear pond for swimming, as well as bathhouses for changing, Kingston State Park is a fun day trip to visitors and locals. Picnic tables and rest rooms are added conveniences. Its proximity to Canobie Lake Park makes it fun stopover after a hot day of amusements. Silver Lake State Park is a relaxing spot that’s perfect for families. Featuring a 1,000-foot beach, visitors can spend the day swimming, boating and picnicking. Get there early on the weekends, as only so many are allowed admission at once. It’s well worth rising early, however. This is a sweet New Hampshire spot. For outstanding views of New Hampshire’s White Mountains, visit Winslow State Park. Located on the northwest slop of Mount Kearsage, the picnic area is actually a 1,820-foot plateau. A one-mile trail takes visitors to the summit of Mount Kearsage. 10,000 acres comprise Bear Brook State Park—the largest developed state park in the Granite State. There are two archery ranges, 40 miles of trails for hikers, cyclists and equestrians, a 101-site campground and a campground beach. There is a day area for those not camping, too. Your pets may join you for the day or overnight, but must be on leashes at all times. Located on Everett Lake, Clough State Park affords visitors the opportunity to swim in its crystal clear water. Its sandy beach and picnic area make it a perfect family environment. There are no flush toilets, but portable toilets are on site. Boat rentals are available. View more New Hampshire Parks.